Mary Rich, the mother of slain DNC staffer Seth Rich, is suing Fox News. 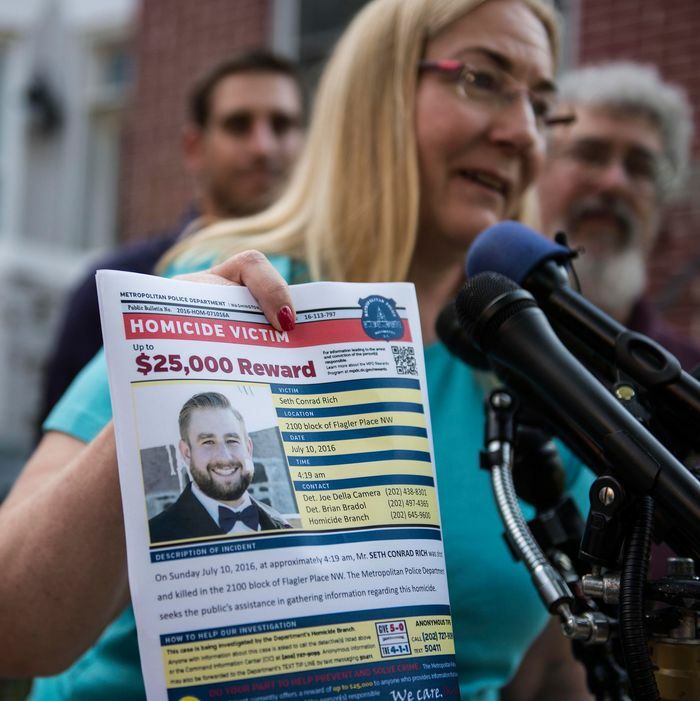 On May 16, 2017, less than year after Rich was killed in what police suspected was a botched robbery, Fox News published an article that said the 27-year-old was in contact with WikiLeaks before he was killed. This fueled a raft of conspiracy theories that suggested Rich was murdered by Hillary Clinton’s henchmen for leaking DNC emails to the group. But the premise of the article soon fell apart after the primary source, who is also suing Fox News, said he was falsely quoted. After leaving the article online for several days, Fox News issued a retraction, but no apology for the story, which by that point had whipped the right, including Sean Hannity, into a frenzy. “We can’t comment on this pending litigation,” Fox News said in a statement. Barrel-chested yogurt foe Alex Jones was among the many conspiracy mongers taken in by the Rich story, but on Tuesday it was another fanciful flight of paranoia that landed him on the wrong side of a lawsuit. Brennan Gilmore, who tweeted a widely viewed clip of a car plowing into protesters at last summer’s Unite the Right rally in Virginia, sued Jones and several others Tuesday for spreading lies about him. A former State Department official, Gilmore was accused of knowing that white nationalist James Fields would drive his car into a crowd during the rally, killing Heather Heyer. Jones, along with Gateway Pundit’s Jim Hoft and former Representative Allen West, who are also named in the suit, painted Gilmore as a “deep state shill with links to George Soros,” the suit says. Gilmore suffered personally after the theories began spreading, the suit says. Not only was he attacked and doxxed online, but InfoWars fans soon found Gilmore in real life and accosted him on the street. He also says he received a powdery substance in the mail along with a note telling him to “burn in hell.” Gilmore is seeking $75,000 in damages.